"Grab those blades and let's go bombing!" From the opening, Jetset Radio Future radiates class. The game is done via cell shading (for those of you who are not familiar with the term, it just means the images are colored to look like a cartoon) with stunning effect. The game looks absolutely gorgeous and plays like a dream. 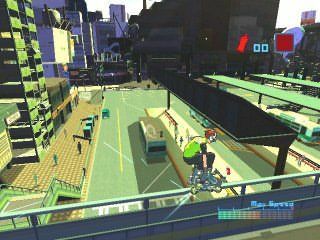 You are a member of an outlaw rollerblade gang within a city closely resembling Neo Tokyo from many a great anime movie. 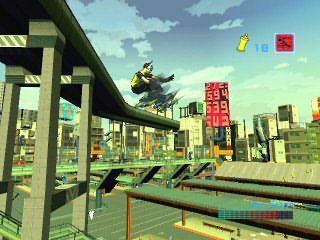 Basically the aim of the game is to skate around pulling mad stunts and bombing (spray painting) buildings and items within the city. Naturally the police and rival gangs are not too happy with this and you'll find yourself a most wanted figure indeed. The control system is simplicity itself and is extremely easy to pick up. Which is a nice change of some of the button mashers on the market. Areas that you are to graffiti are clearly indicated by spinning symbols that will disappear with a triumphant beeping sound once you have completed your art work. For those daunted by the prospect of having to perform meticulous stunts, never fear! Most of the stunts are performed independently by the character and are not truly under your control as long as you keep moving, that's all that matters. One of the things that exceptionally impressed me is the huge draw distance evidenced by this game. Whether this is simply a result of excellent programming or the sheer grunt of the Xbox, I'm not sure but its certainly nice to have no pop-up. 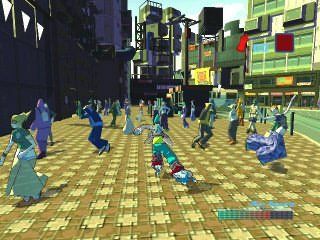 Music within the game is dance based and records are spun for you by the fictional DJ 'Professor K'. The good Professor will also give you important advice on your new level and your mission objectives, so y'all pay attention y'hear. 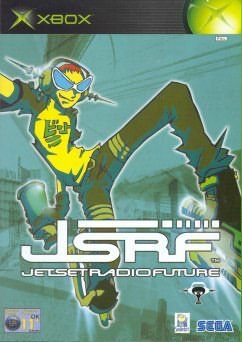 In conclusion, Jetset Radio Future is an absolute blast to play and will have you glued to the Xbox for hours on end. Anyone who likes fun, should consider this title.